Xonar DG Headphone Amplifier 5.1 PCI Sound Card--- Hear all, dominate all! The Xonar DG is the latest addition to the already outstanding Xonar range and is optimized for Immersive Gaming through Precision Audio at an affordable price. 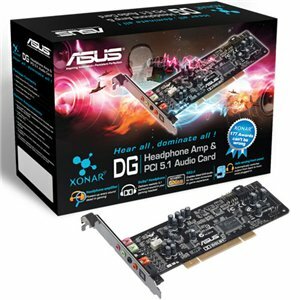 The Xonar DG sound card offers a combination of the Dolby Headphone 5.1 high definition surround feature, ASUS’s own GX 2.5 gaming audio engine providing EAX 5.0 support in even the latest Windows 7 operating system and an on-board headset amplifier with 3 settings for fine tuning, these result in the best in class accuracy and deep audio that brings every sound to reality, making the new Xonar DG an ideal sound card for gamers who want to dominate their opponents and get closer to the action, after all there are no points for second place.